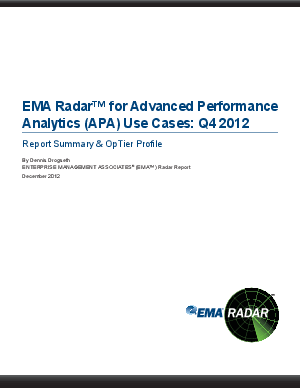 This new Radartm report from Enterprise Management Associates (EMA) introduces Advanced Performance Analytics (APA). EMA defines it, brings real-time or near real-time "big data" to IT operations, architects, service managers and even applications development, as well as IT executives and non-IT business stakeholders. APA has evolved out of classic service performance management, but with a twist - rather than siloed approaches to monitoring and analysis, APA demands more eclectic data collection, huge levels of analytical scalability and strong insights into cross-domain and/or business outcomes. Download the report to learn all the EMA findings plus how OpTier is one of the true trend-setting innovators in the APA arena, with a unique focus on business impact and performance.